At Johnny's Green Room's long, canopied bar, my friend the photographer, secure in his masculinity, orders a drink called Princess Peach. It's a mix of peach vermouth, vodka, lemon juice, soda and – the clincher – hopped grapefruit bitters. It arrives less exuberantly garnished than I'd hoped, served long with decent ice and topped with a restrained sprig of mint. 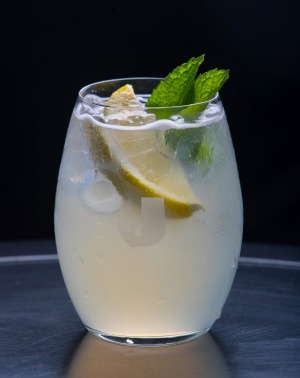 It's a solid, stylish, refreshing drink, adjectives that could equally apply to Johnny's. The original Johnny's Green Room was a notorious all-night pool hall and diner, a hangout for students, artists and gangsters. It was an unofficial clubhouse for underground and bohemian Carlton of the day. 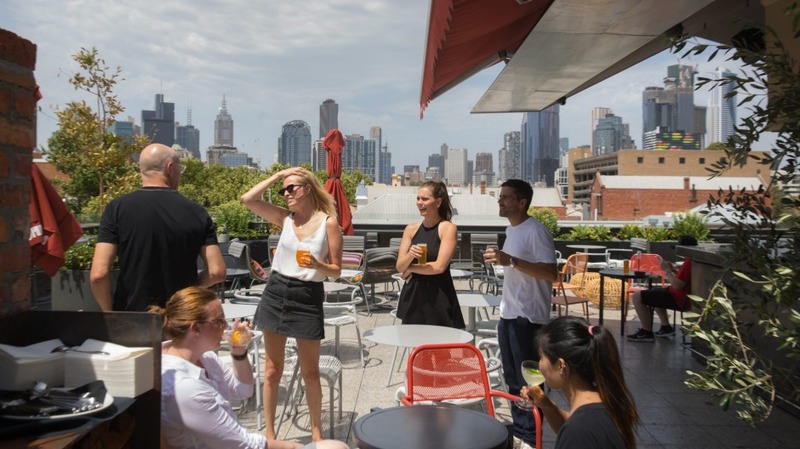 The new rooftop incarnation, part of the long, drawn out King & Godfree redevelopment, could be read as making a bid to be a clubhouse for modern-day Carlton's more well-heeled demographic. Terrazzo tiled and decked out with a showroom's worth of assorted outdoor furniture (some of it more comfortable than others) scattered with colourful cushions and shaded by orange umbrellas, the terrace deftly channels an Italian rooftop party/beach club vibe. There's greenery in planters and pots, a long, metal-topped bar where you order drinks and food and, for when the weather cools, a couple of bricked open fireplaces that, cleverly, also serve to divide the expansive space. Then there's the view. Johnny's is only two storeys up but the outlook's superb. City skyscrapers look close enough to touch in one direction, the blade of the museum punctuates another and the textured roll of Carlton's rooftops and boxy modernist public housing shade the spaces in between. Both drink and food lists are a lesson in brevity and focus. There's nothing challenging here – who wants to be challenged at a rooftop party? – but the quality of the ingredients and the booze stick with the comfortable, well-heeled vibe. The page-long cocktail list has a section of spritz and original cocktails that put an Italian spin to classic drinks. The Black Manhattan, for example is a punchy, bitter-delicious version of the classic Manhattan. It's made with rye whisky, Averna and walnut bitters and arrives dark, strong and ungarnished. There's a good range of beer on tap, running the gamut from Peroni to local heroes like Moon Dog and Sample. There's also wine on tap, including a bright, juicy field blend from Montevecchio, the range of wines made with Italian grape varieties by Chalmers in Heathcote. This one includes lagrein, nero d'Avola and sagrantino. The single-page food menu offers a good range of the kind of food you'd expect at any self-respecting modern Italian-Australian rooftop bar. Freshly shucked oysters share space with salumi. There are arancini (tomato and cheese) and excellent veal and pork polpetti doused in tomato sugo. A wagyu burger comes with cheese and fries, a warm chocolate brownie with fior di latte gelato from downstairs gelataria Pidapipo. It's early days but Johnny's has the stuff that Carlton classics are made of: low-key style, attention to detail, traditional Italian flavours. All that and a view fit for a Princess Peach. A solid rendition made with Poor Tom's Sydney Dry Gin and Italian dry vermouth from Chazalettes. Could use a little more chill ($20). 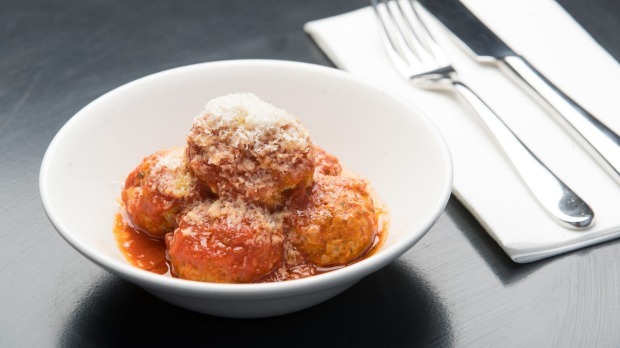 Only a monster would refuse polpetti, particularly these delicious pork and veal meatballs in house-made sugo. Perfect rooftop party snack ($11).